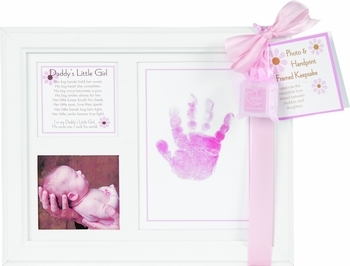 This frame is 8x10 and features a Daddy's Little Girl poem with a place for baby's picture and their little hand print. Includes a pink child-safe stamp and full instructions. comes packaged in a clear gift pouch with gift tag and satin ribbon. See More Images above to read poem included with this frame.